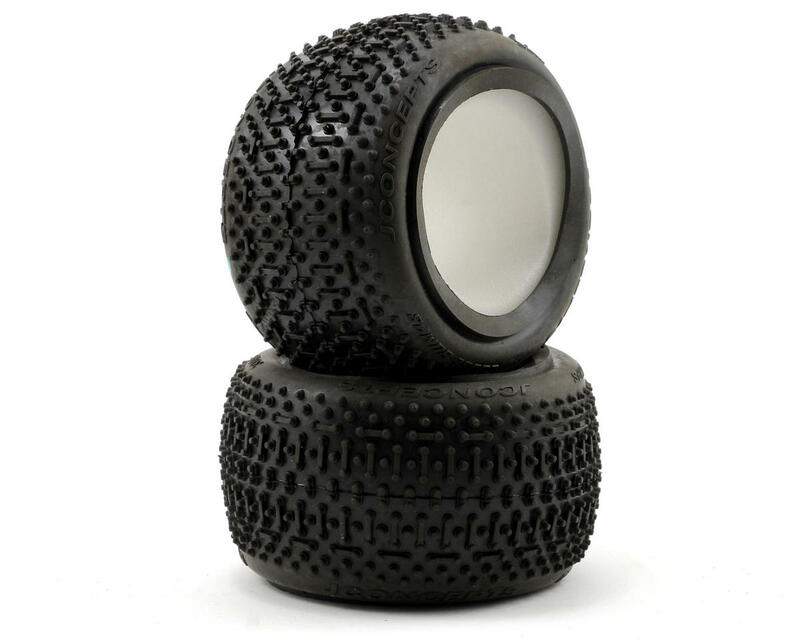 This is a set of two JConcepts Goose Bumps 2.2 Rear Buggy Tires. The JConcepts Goose Bumps tire is just what the doctor ordered. The totally unique step pin and bar lug design combined with sticky compounds like yellow, blue and green allow even greater control on slightly loamy and wet conditions. The Goose Bumps are a special breed, designed for maximum performance when new or used as the design allows even wear all the way down to the tire body. Once the driver wears through the initial pin, a bar follows to maximize potential on aggressive surfaces. The Goose Bumps incorporate a compact tire body with a crisp tread pattern with precise separation for intense racing competition. Goose Bumps in new condition excel on soft surfaces with either dry or wet conditions. Worn Goose Bumps excel on indoor or outdoor clay tracks where a slight groove has formed. Awesome amount of traction even after 3 race on the 1 battery it still popped wheelies on the grass! !